Radiant floor heat – One thing to consider is how you are going to provide heat to your home, especially during the coldest winter months. Radiant heat rises out from the floor, and can be fueled by electricity, heated air or hot water. In single family homes, hot water systems are used most often because they are the most cost effective. Tubing is laid under the floor, and hot water funs through from the boiler. Recycled wood or plastic composite lumber – Re-using materials that might end up in a landfill otherwise is a perfect way to make your home a little more green. These materials are becoming common in playground equipment, and the National Association of Home Builders reports that using plastic waster with wood fibers creates lumber that is less toxic and more durable than regular treated lumber. Materials with plastic help to reduce mold and rot, making it the perfect choice for decks and patios. Low-e windows – Giving your house the ability to hold its temperature through low emissivity (low-e) windows is an easy way to make your home more energy-efficient. These windows require more of an upfront investment, but they quickly put that money back in your pocket through reduced energy bills. Insulated concrete forms – Another alternative to wood is insulated concrete forms, which can reduce energy consumption by as much as 20 percent in colder climates. Recycled steel – Using steel beams in construction can add stability and take away the risk of mold or rot you could get from wood. Steel beams are commonly made from scrap metal from cars, instead of a natural resource like wood. By using scrap metal, 75 percent less energy is used over making new steel. 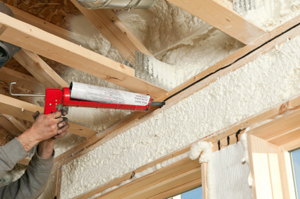 Plant-based polyurethane rigid foam – Insulation plays a large part in whether or not your home is energy efficient. One of the best insulation options is made by a company that previously manufactured surfboards. After a slap on the wrist by the Environmental Protection Agency, the company stopped using hazardous materials in their boards and began using plant-based polyurethane rigid foam, which they realized was excellent insulation. It is often the case that green products are initially more expensive, but by investing in the products now, you save in future energy costs over the lifetime of your home. You can also take even more pride in your energy-efficient Atlanta new home and know that you are benefiting the overall good of the environment. This entry was posted in Energy Efficient and tagged atlanta new homes, Energy Efficient, energy efficient products, National Association of Home Builders on May 28, 2013 by Carol Morgan.